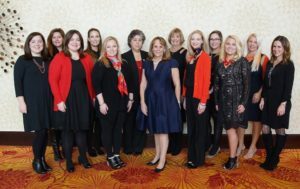 On Friday, December 2nd the Junior League of Lancaster presented its 14th annual Author’s Luncheon. The luncheon featured guest speaker and New York Times Bestselling Author Laura Schroff, author of An Invisible Thread. Over 400 Sustainers, Actives, and community guests enjoyed an afternoon of food and friends at the Penn Square Marriott. Anne Shannon served as Master of Ceremonies. The event began with an inspiring welcome from current President Ann Carter who focused her remarks on the parallels between Ms. Schroff’s story and the current projects of the League. She also presented the League’s marketing video. In addition to her speech, Ms. Schroff met with students from Linden Hall, a current cornerstone sponsor, and signed books for guests before and after lunch. The event also included a silent auction and raffle which contributed to its total profit of $13,500. The committee would like to thank all Sustainers who supported the event.